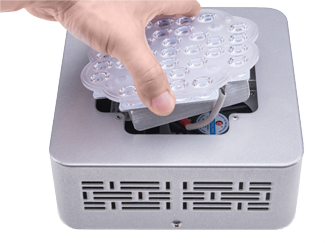 Luckygrow provides an easy and intuitive way of replacing the lightsource. Adjust to the lighting requirements of your plants! Luckygrow panels reach an extremely high PAR 2400 µmol/s*m² value. Luckygrow power supplies were developed/customized to work with our lighting modules, because of that LuckyGrow lamps have a very long life span. 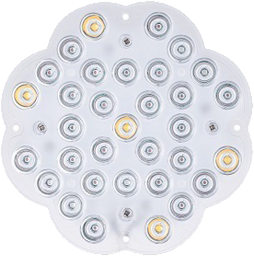 Every lighting module is equipped with an individual power supply. Each Luckygrow panel has a socket that provides the possibility to daisy chain power to another lamp. Each lighting module has installed a passive radiator that allows diodes to work with 100% efficiency. 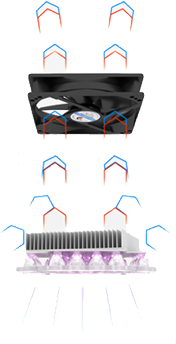 Luckygrow panels have a built in super quiet fan that allows silent ( < 40db) and efficient operation. Thanks to specially designed vent holes air can flow easily between the radiators and the fan.